At Global Maxlink, we pride ourselves on importing only the highest quality nori available including both conventional nori and certified organic nori products. Our overseas production facility is in full compliance and certified with the U.S. National Organic Program (NOP), The USDA Certified Organic Program, Star-K Kosher Certified, as well as fully ISO 9001, 2000, 2200 and HACCP Compliant. In addition to our conventional nori items seen on our products list below, we also inventory RAW CERTIFIED ORGANIC NORI SHEETS, POWDER, AND FLAKES. All of our "IZUMI" brand certified Raw Organic Nori sheets, powder, and flakes are produced from only Grade "A" product harvested from a single growing site. Only the upper 15% of production will qualify for this grade. Our Raw Nori items are USDA Certified Organic, Non GMO, and Star-K Kosher Certified. All products are inventoried in California. Although all our Conventional and Raw Organic Nori products go through strict overseas testing, we at Global Maxlink additionally test our Nori items at two different independent laboratories here in the United States. (California and New Jersey) We test for more then 450 potential containment's as well as 25 different Isotopes of Radiation. All our Nori products test "Clean" in every category. FREE SHIPPING on all case quantities shipped in the lower 48 United States. Other listed shipping rates are for orders shipped within the continental United States. All case and single pack orders will be shipped via FedEx Ground. Pallet orders shipped via common Carrier. Express is available with extra cost upon request. There is an additional surcharge for orders shipped to Alaska, Hawaii, US Virgin Islands, and Canada. Contain 24 pack each, 10 full sheets (7.5" X 8.25") Grade A nori and an authentic bamboo sushi rolling mat. Radiation tested and Kosher certified. Contact us for special rate on orders of 4 cases or more. Contain 10 full sheets (7.5" X 8.25") Grade A nori and an authentic bamboo sushi rolling mat. Contain 500 full sheets (7.5" X 8.25") Grade C nori packed in 10 bags. Contact us for special rate on orders of 4 cases or more. Radiation tested and Kosher certified. Contain 1000 full sheets (7.5" X 8.25") Grade B nori packed in 10 bags. Contact us for special rate on orders of 4 cases or more. Radiation tested and Kosher certified. Contain 100 full sheets (7.5" X 8.25") Grade B nori packed in a bag. Contain 1000 half sheets (7.5" X 4") Grade C nori packed in 10 bags. Contact us for special rate on orders of 4 cases or more. Radiation tested and Kosher certified. 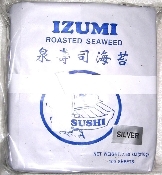 Izumi Brand Grade D Green Nori is a quality above average grade that is commonly used in production food kitchens and in volume restaurants. A good value. Contact us for special rate on orders of 4 cases or more. Radiation tested and Kosher certified. The following wholesale products are in inventory. Please contact us for quote. 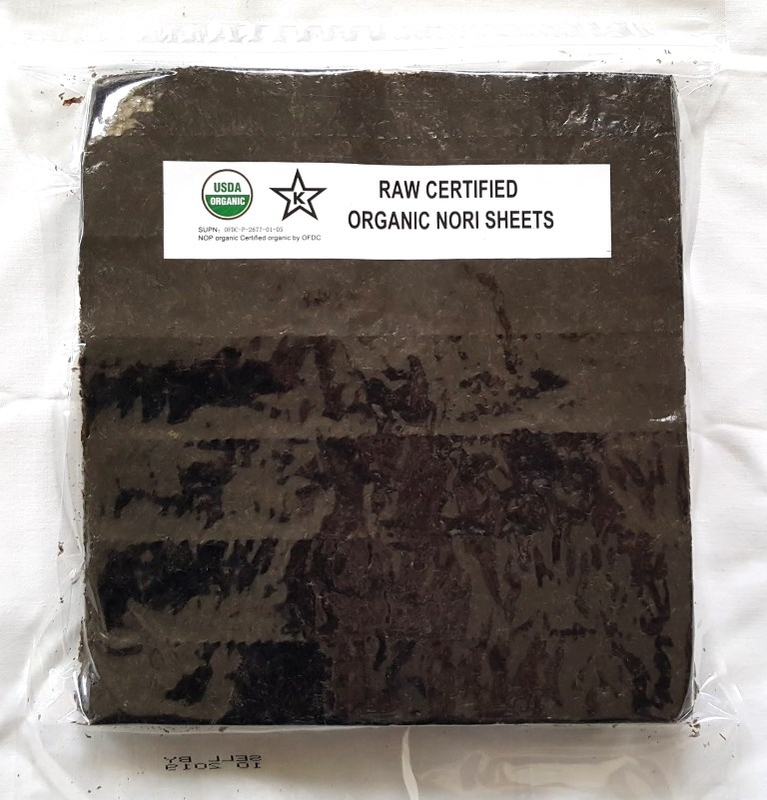 Raw Nori Pack: Raw Certified Organic Nori Sheets "Clear Plastic Pack". Same product as "IZUMI" brand above, but in clear package for customers wanting to use there own labels. 10 sheet and 50 sheet packs with 500 total sheets per case. Sold in case quantities only. 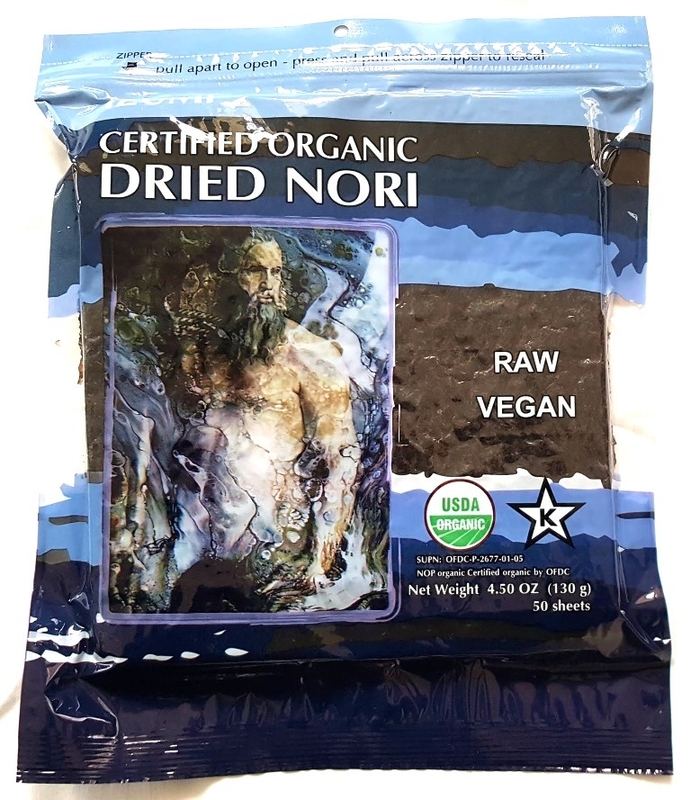 Nori Flake Pack or Powder: Bulk pack Raw Certified Organic Nori Powder or Flakes. 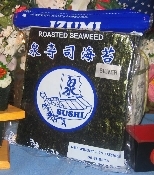 Made from same high grade Nori as the Raw sheets listed above. Packed in 1 kilo (2.22lb.) bulk bags. Sold in 1 kilo increments. Custom specifications or packing is available.